If you’re not confident in your fluid measurements, you may be in store for big problems. For example, mismeasurement of ingredients flowing through pipes in a chemical processing plant could result in products being ruined or dangerous compounds being created. To protect your operation, make sure you are using reliable Oilgear flow meters in San Francisco CA to monitor all fluid activity. Diverse fluid compatibility: Virtually any process fluid imaginable can be run through Oilgear flow meters in San Francisco CA, provided that steps are taken to exclude entrained gases from measurement. For example, you could measure sea water, crude oil, fertilizer solutions, anhydrous ammonia, diesel fuel, and much more. Accurate measurements: Oilgear flow meters in San Francisco CA can take a lot of abuse without having their accuracy suffer. For example, you can run up to 130 percent of maximum flow without altering the reliability of readings. Whether you prefer a mechanical or LCD readout, the mechanism on your Oilgear flow meters in San Francisco CA is going to be inside a heavy duty casing offering protection from corrosion and contamination. The meters can be rigged up for remote reading with either active or passive transducer technology. Need Help Choosing Your Oilgear Flow Meters in San Francisco CA? Don’t feel like reading all of Oilgear’s product documentation yourself? Ask us instead. 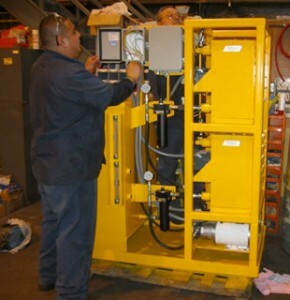 After nearly 40 years of experience in the hydraulic parts and service industry, we know Oilgear’s products and we can match their flow meters to your needs.